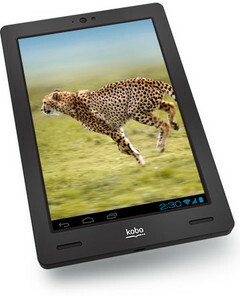 Unlike their competitors (Amazon, and Barnes and Noble) Kobo has set out to make tablets that are optimized for reading. The new Kobo Arc tablets will build on the features of the previous Arc and offer an experience that keeps books and reading firmly in the spotlight. The new interface offers simplified access to ebooks, a suggestion bar for new content, and a reading mode which optimizes battery life and disables all pop-ups and notifications. An important feature to note is that the new Arc tablets run Android (4.2.2). Kobo has added on their own skin, but the core experience is still the same as we see on other Android devices. The Toronto based company has also learned from B&N's mistake and is offering unrestricted Google Play access from the start. The Arc 7 will replace the current Arc tablet. It features a 7-inch 1024 x 600 display, an unspecified 1.2 GHz quad-core processor, 8 GB of internal storage, a microSD slot, and a 0.3 MP front facing camera. The Arc 7 HD offers a jump in specs with a 7-inch 1920 x 1200 display, a 1.7 GHz quad-core processor, 16 GB of internal storage, and a 1.3 MP front-facing camera. The Arc 10 HD is Kobo's top of the line. It has an impressive 10-inch 2560 x 1600 display, a 1.8 GHz quad-core processor, and 16 GB of internal memory. The new Arc tablets are all expected to launch on October 16th with prices ranging from US$150 for the basic Arc 7 to US$400 for the Arc 10 HD.